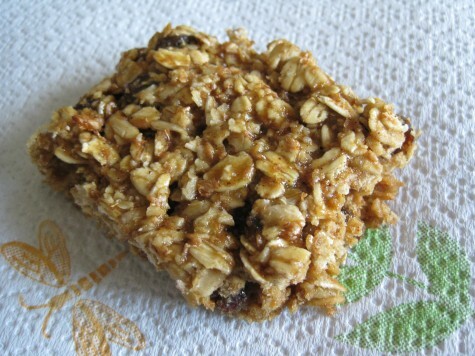 Midterm oatmeal bars and a few of my favorite things…. Lately it feels like I’m never NOT studying for midterms. As annoying this is (besides the obvious hit to my social life), it has also has a positive impact, at least for D. I’ve been baking. A LOT. Not to sound Betty Crockerish, but there is something incredibly therapeutic about baking and smelling those delicious sweet smells in my house all day. And my Keebler elf baking habit also is a great way to procrastinate from the pile of notes that I have to read over. I decided to turn my lemons into lemonade. Or in this case, my oats into delicious, gooey, chocolatey oatmeal bars. Not only are they scrumptious, they have oats, whole wheat flour, and cranberries. While I wouldn’t call them “health food”, they definitely make a nice treat at the end of the day. Just be warned that these guys can get a little dangerous if left out – so I recommend freezing any that you don’t think you’ll eat during the week. 1. Preheat oven to 350*F. Spray 8-inch square baking pan with non-stick cooking spray. 2. In a large mixing bowl, combine ingredients until smooth. 3. Spread batter in prepared baking pan, and bake for approximately 20-25 minutes until bars are cooked all the way through. Stay posted Thursday for a few more of my favorite things and a how-to on healthy packing for work trips/vacations!